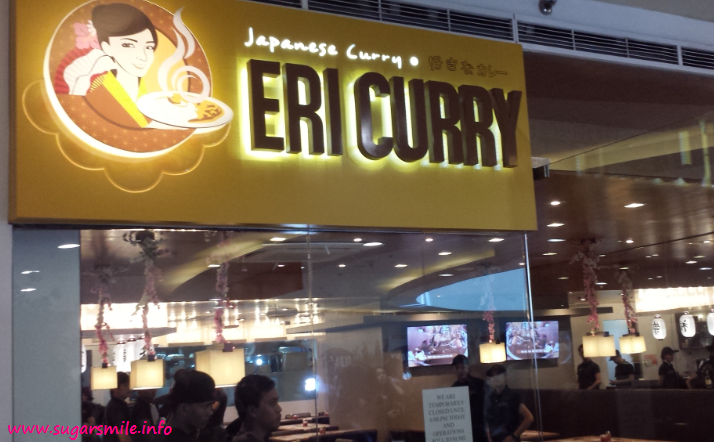 Eri Curry opened at the 3rd Level Atrium of SM Megamall last July and they held the Grand launch last September 10. They introduced Chef Erica, the face (and brain) behind Eri Curry’s sumptuous menu. Since we will also be having a food tasting that day, I ordered the Katsu Curry with “just right” sauce. Mind you, I was really excited to try out their dishes because every time I pass by their place for lunch, it was always packed with people. 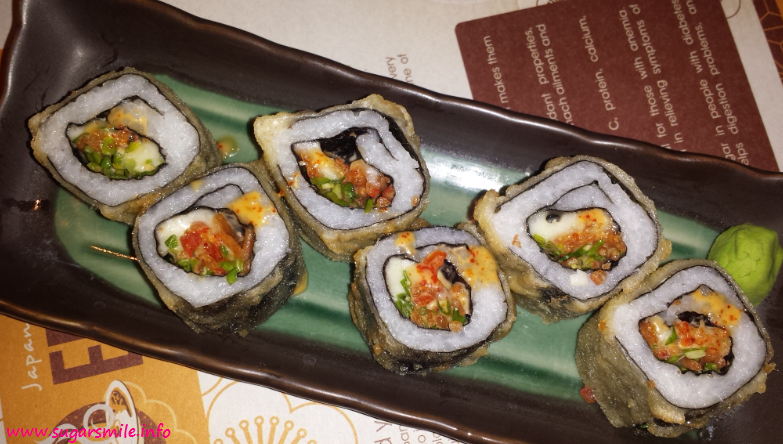 Before the main character in my foodie afternoon arrived, we were served by different kind of sushi dishes. 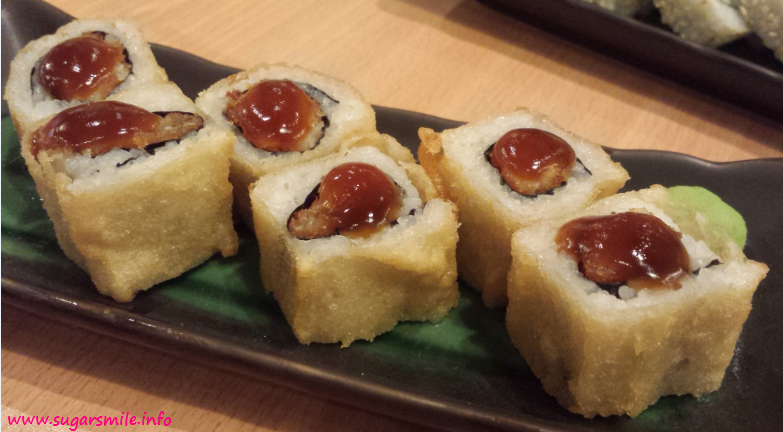 If you have been following my blog, you’ll know that sushi is a staple everytime I go to a Japanese restaurant. I’d even go to a buffet just so I could have my sushi fix. 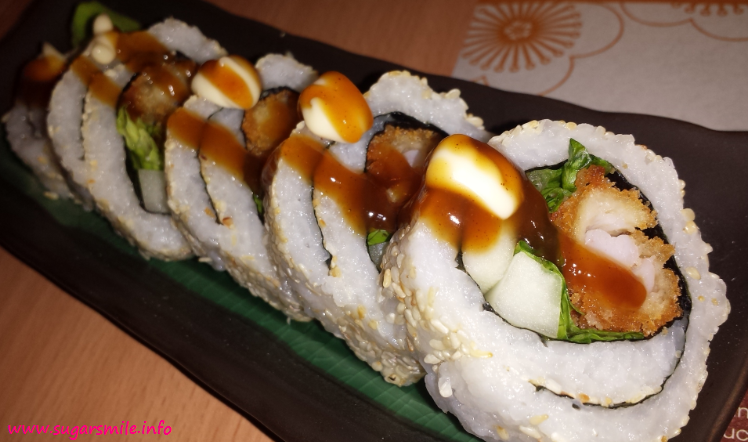 We had the Ebi Futo Maki (shrimp maki with lettuce romaine and cucumber), Sakana Warm and Tender (sole fish with mayo) and Kani Warm and Tender (fried crab sticks topped with teriyaki sauce). for the appetizer. I just can’t get enough! I think I ate more than my seatmates did (sorry!) I just can’t resist them. My favorite would be the latter because it’s sweet and crunchy at the same time. When my Katsu Curry arrived, I already smelled that different spices that were put together on my plate. It smells really yummy! The curry sauce was divine and since I didn't order the spicy stuff, the hefty serving is enough for me to reach the curry craze. Step 2: Choose your rice portion. The Japanese rice comes in 200, 300 and 400 grams. Step 4: Add Toppings. You can choose from crispy fried chicken, fried squid or thin sliced pork or vegetables like eggplant, asparagus and tomatoes. They also have Omelette curry plates like the Katsu Omelette Curry and Creamed Chicken Omelette Curry. If you're bringing kids, you can always order their Hamburger meal topped with fried quail eggs or Crispy Chicken Meal. And in Eri Curry, not all dishes are spicy, for dessert, you can order their bestselling Kagigori, shaved iced with vanilla ice cream and azuki beans. They also have banana split, which is an ultimate favorite. So what are you waiting for? This Japanese reinvented restaurant is truly one for the books. Head on to Eri Curry now and reach your own curry nirvana. Know more about Eri Curry through their Facebook Page at www.facebook.com/EriCurry2014.